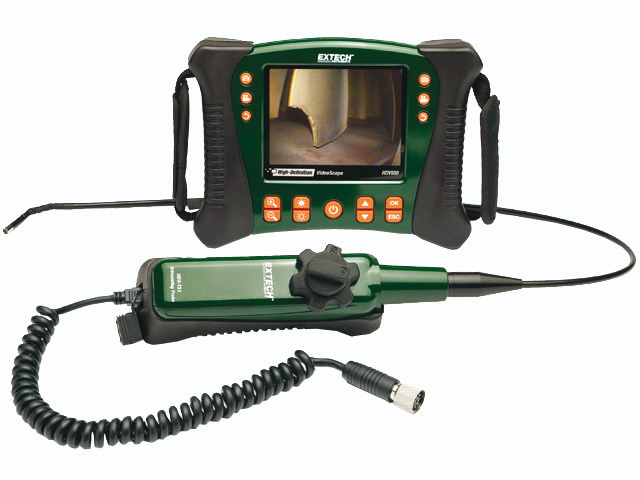 New EXTECH HDV series videoboroscopes consist of shock and water resistant 5,7” display with the resolution of 640x480 pixels. The kit also includes a camera mounted on a cable. There is also a set of optional accessories which includes: camera with the diameter from 4mm to 25 mm mounted on cables with the length from 1 m to 30 m.
There is a possibility to record the images or video films on a memory card. The equipment is designed for inspection of difficult-to-reach areas such as ventilation ducts, machine interiors, wire routes. HDV610 Boroscope with a 5,5mm dia. camera on a 1 m flexible cable. HDV620 Boroscope with a 5,8mm camera mounted on a rigid, formable cable. HDV640 Boroscope with a manipulator controlled, 6mm dia. camera mounted on a flexible, 1m cable.